What is the height of Aquaman? Here are some information about Aquaman's height. Aquaman, also known as Orin Atlan-son or Arthur Curry, is a fictional superhero by DC Comics. He is the ruler of Atlantis and the oceans of the Earth. Aquaman is one of the founding members of the Justice League of America, together with The Flash, Batman, Green Lantern, Martian Manhunter, Wonder Woman and Superman. 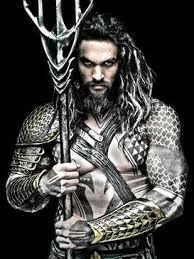 Today, year 2017, Aquaman appears in the movie Justice League, and his role is played by Jason Momoa. Jason’s height is 1.93 m or 6’4”. The original Aquaman, in the comics, is much shorter though. The height of Aquaman is 6ft 1in, that makes him 185cm tall. Aquaman's height is 6ft 1in or 185cm while I am 5ft 10in or 177cm. I am shorter compared to him. To find out how much shorter I am, we would have to subtract my height from Aquaman's height. Therefore I am shorter to him for about 8cm. And see your physical height difference with Aquaman. Do you feel that this height information for Aquaman is incorrect? Leave your comments and suggestions below and help us make this height listing for Aquaman more accurate.